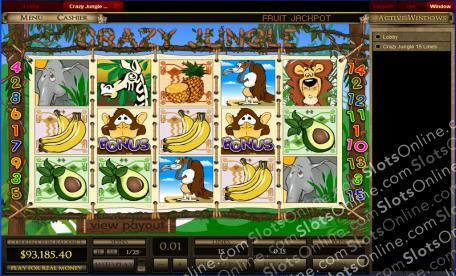 Take a trip to this crazy jungle to befriend a few jungle creatures for a chance to win a massive jackpot! Click here to play! As you're exploring the lush, green landscape of this jungle, you'll want to keep a close eye out for the illusive parrot. Not only does this pretty polly act as a wild symbol, but it will payout a massive progressive jackpot if you can spin five of them across an active line while betting max on all lines. Though don't focus all of your attention on this bird, as there are plenty of other creatures to help you out. Spin two to five lions across an active payline and you'll get up to 9000 times your line bet. Two to five zebras will get you up to 1500 times your line bet. Two to five vultures or elephants will bring in a top prize of 500 or 250 times your line bet respectively. There are also pineapples, bananas, coconuts, and avocados to help you spin in wins. Watch out for the slithering snake, as this reptile is a scatter and will award you with a number of free spins. There are also some cheeky monkeys wandering the Crazy Jungle. Three of these on selected reels will activate a bonus round that will see you searching for bonus cash prizes! So scour the Crazy Jungle to find all of the animals and spin in the big wins. The green slithering snake is a scatter. Spin this reptile on reels 1 and 5 at the same time and you will get five free spins in which prizes are doubled. The Parrot is a wild symbol. He will substitute for all other symbols (excluding bonuses and scatters) to help you bring in more wins. If you spin five of them while betting on all lines with a maxiumum bet, you will win the progressive jackpot. If you spin three cheeky monkeys on reels 2, 3, and 4 you will trigger a bonus feature. During this game, you will have to choose from three stacks of bananas to reveal your bonus prize.